Baking soda scrubs are ill-advised. They're just too abrasive, causing tiny micro-tears in skin which can lead to skin problems you wouldn’t otherwise have. Adding insult to injury, baking soda has a pH of 9, which is too alkaline for skin to tolerate. The pH of skin is about 4.5–5, so the skincare products you use should be nearer to that range (with the top range being pH 7, which is the pH of water). Coffee grounds, salt, cinnamon, and sugar as scrub ingredients are all too abrasive. To one degree or another, they all cause micro-tears in skin that result in redness, irritation, and damage to the skin’s surface. Cinnamon can also cause a burning sensation on skin similar to chili powder! None of that should ever be a part of daily skincare. 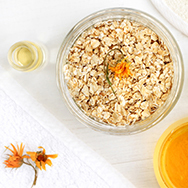 If you really want to try a homemade scrub, oatmeal scrubs can be a decent option because the edges are soft and get even softer when mixed with water. The one drawback is the paste created when you mix water with oatmeal; it can be difficult to massage around your face and to rinse from skin, but at least it doesn’t damage skin, so that’s a good thing. We recommend ditching these home remedies and exfoliating your body a more effective way that's also gentle on skin, with either our RESIST Weightless Body Treatment with 2% BHA or our RESIST Skin Revealing Body Lotion with 10% AHA. Pure coconut oil as a moisturizer can be great for dry skin, but if you have combination to oily skin or struggle with clogged pores, it's not the best option for you. Coconut oil is about 80% to 90% saturated fat, higher than butter and lard. That means even though pure coconut oil starts out as a liquid, when it absorbs into pores, it can revert to its solid state and block pores, the opposite of what you were hoping for. Witch hazel is often recommended for use as a toner or astringent, but all we can say is “don’t do it”; this plant extract is an extremely unfriendly skincare ingredient. Witch hazel is distilled using alcohol, and a lot of it, and this almost instantaneously depletes the skin’s protective barrier, causing dryness and flaking. Adding to your skin’s distress are the tannins and eugenol witch hazel also contains (eugenol is a volatile fragrance compound), which are all potent skin sensitizers. Why bother using a witch hazel toner when there are better options that balance, replenish, hydrate, and soothe skin without the potential problems? Mayonnaise may be good for sandwiches, but it’s a problem for all skin types. If you have combination to oily skin and clogged pores, the egg yolk and oil in mayonnaise will feel greasy and can clog pores. And no matter your skin type, the vinegar that mayonnaise contains can cause a negative reaction that leads to redness and dryness. Toothpaste as a remedy for breakouts is a bad idea. Many of the ingredients in toothpaste, especially fluoride, peppermint, mint, menthol, and other flavorings, are skin sensitizers and can make skin redder, increase bumps, and also make the leftover red marks last longer. Plain and simple, toothpaste is great for teeth and should be used for that purpose only. One more point: You can’t “dry up” a pimple, because breakouts aren’t about skin being wet. Want to Know More About DIY Skincare? Look up the individual ingredients in our Cosmetic Ingredient Dictionary or check out our other in-depth articles about home remedies for skin.